Straight Arm DR | Konica Minolta Healthcare Americas, Inc. The Straight Arm System includes a 17” x 17” detector that captures high-resolution digital images in seconds. Combined with Ultra, the state-of-the-art Konica Minolta imaging software, the end result is detailed bone and soft-tissue visualization for a complete diagnostic picture from a single exposure. 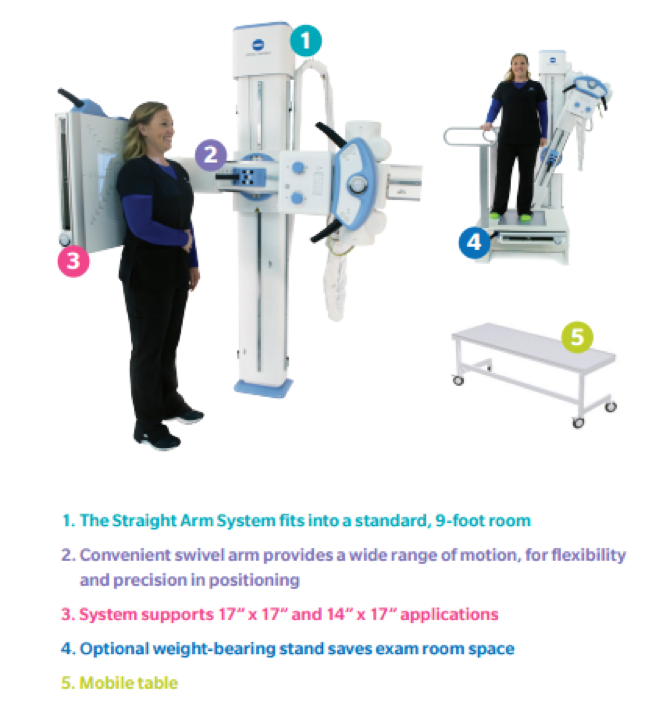 The Straight Arm System base and swivel arm install flush with the wall to maximize every square foot in your space, allowing you to avoid overcrowded exam rooms and provide your staff with freedom to maneuver and care for patients. There is also no permanent exam table required, giving you additional exam flexibility. A full range of motion enables all imaging views required, while accommodating patients who are standing, sitting, lying on a table or confined to a wheelchair. The swivel arm rotates 135 degrees clockwise and counterclockwise and moves 39 inches vertically to easily arrive at the ideal exposure position. The detector also tilts 45 degrees in two directions. 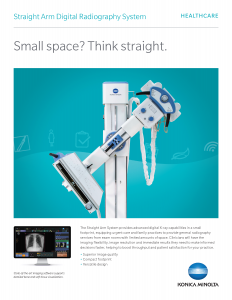 To minimize downtime, maximize productivity and mitigate risk over a long functional life, the Konica Minolta Blue Moon Select plan for the Straight Arm Digital Radiography System goes beyond typical warranty coverage by including DR panel protection, software updates, onsite service, remote applications, and 24/7 technical assistance. One simple plan. No worries. Sign up at the system point of sale for the lowest five-year cost of ownership.